In today’s Rulesfest we talk about the First Rule of Sometimes: If you don’t move a bit when a card resolves, then that card doesn’t affect your Fortitude, Alcohol Content or Gold. Zot Player: Huzzah! I got a Holy Water! Deirdre Player: Let me help you with that. I play “Water into Wine” and add 2 Alcohol Content to your Holy Water. Zot Player: I play “The stars say, ‘No!’ “ to ignore your card! Deirdre Player: You can’t do that. There are many different cards that create very similar scenarios in the game. Today we are going to discuss the First Rule of Sometimes: If you don’t move a bit when a card resolves, then that card doesn’t affect your Fortitude, Alcohol Content or Gold. However, you might be saying: “But Deirdre’s card will cause me to gain Alcohol Content if I don’t stop it!” While that is true, we only have to look back to the First Rule to understand what’s going on. Ask yourself: “At the moment when Deirdre’s card resolves, will Zot’s Alcohol Content change?” If the answer is “No” then the card does not affect Zot’s Alcohol Content. 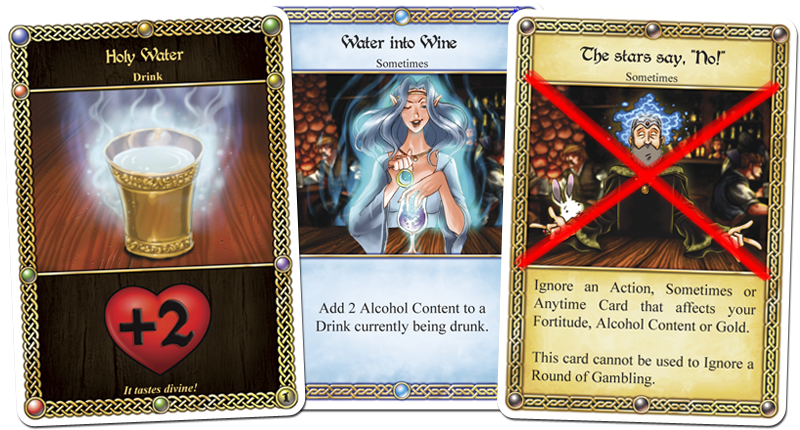 In this case, when Deirdre’s card resolves it only changes the effect of a Drink card, and doesn’t actually move Zot’s Alcohol Content marker. Keep in mind that even if a lot of cards have been played in response to one another, they still only resolve one at a time. Ozrik Player: I play “Recharging the Elements” to gain 1 Fortitude. Joran Player: Sorry Ozrik. 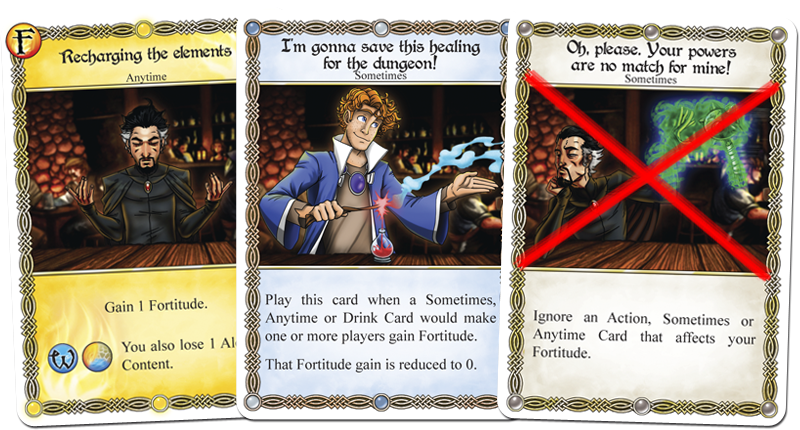 I play “I’m gonna save this healing for the dungeon!” to reduce that Fortitude gain to 0. Ozrik Player: “Oh please. Your powers are no match for mine!” lets me Ignore your card! Unlike the above example, Joran’s card is actually affecting Ozrik’s card. However, Joran’s card does not directly affect Ozrik’s Fortitude. Once again, ask yourself: “At the moment when Joran’s card resolves, will Ozrik’s Fortitude change?” In this case, the answer is no because when Joran’s card resolves all that changes is the effect of Ozrik’s card and doesn’t move Ozrik’s Fortitude Marker. Remember: cards really only affect you when they move your bits around as they resolve (and they resolve one at a time!). 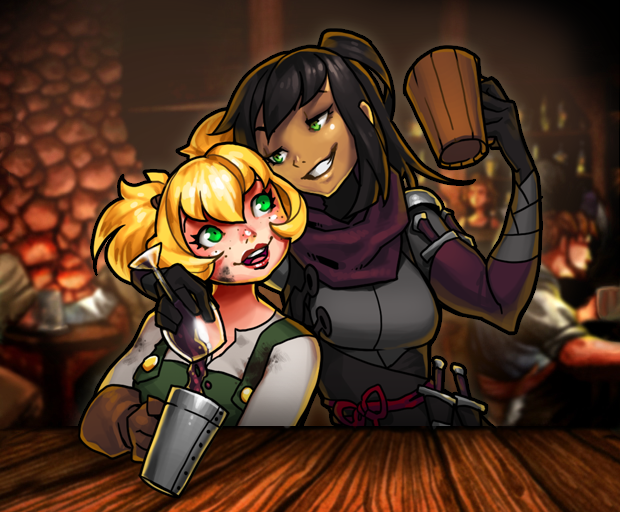 So when you sit down to your next round with those craft characters who mess with your drinks, make sure you’re holding onto those Ignore Drink cards!